Red beans are highly underrated in the nutritional world, often overlooked in our quest for the latest and greatest healthy food trend. Here in New Orleans, red beans are so engrained as a part of our culture, cuisine and our weekly routines that most of us give very little thought – if any – to just how nutritious they really are. But the reality is that red beans are tiny little nutritional powerhouses that are just as nutritious as they are delicious. Here are 5 reasons to eat red beans – any beans, really – and how to get more into your diet. The term ‘superfood’ is tossed around blithely, but red beans truly qualify: ounce-for-ounce, they have a higher concentration of antioxidants than popular superfoods like blackberries, raspberries, blueberries, garlic or almonds. In fact, red beans are among the 50 top antioxidant-rich whole foods ranked on the ORAC Scale (Oxygen Radical Absorbance Capacity), a system developed by the National Institutes of Health (NIH) to measure antioxidant concentration. Red beans are an excellent source of plant-based protein, with one cup providing 16 grams of protein – more than you get in two ounces of grilled chicken breast or in two large eggs. Proteins are made of just 20 different amino acids, with 8 essential amino acids that our bodies don’t make: isoleucine, leucine, lysine, methionine, phenylalanine, threonine, tryptophan and valine (Histidine is technically a ninth essential amino acid, but is only essential for infants, not adults). 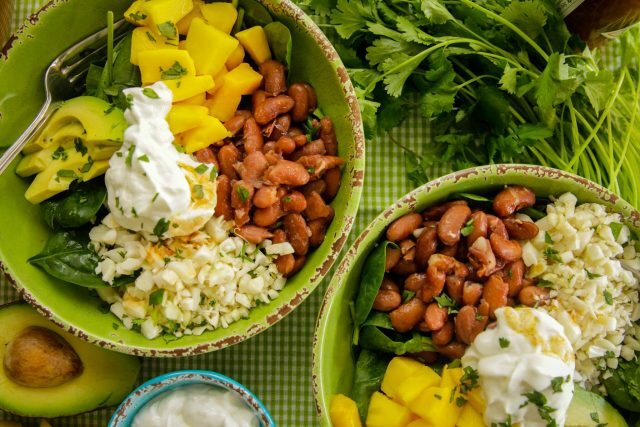 A common misperception is that beans must be paired with rice in order to get the full spectrum of essential amino acids, since beans are lower in methionine (which rice contains) and rice is lower in lysine (which beans provide). But as long as we incorporate a variety of plant-based foods throughout the day (not necessarily at the same meal), we’ll get the full spectrum of essential amino acids that our bodies need. With more magnesium and calcium than a sports drink and more potassium than a large banana, red beans are loaded with electrolytes to help prevent or relieve muscle cramping. A single cup of red beans packs in 16 grams of fiber, as much as you’d get in five slices of whole grain bread. Added bonus: They’re also rich in soluble fiber, which helps to reduce cholesterol levels and stabilize blood sugar levels. One cup of red beans provides 20 percent of the daily value for iron and one-third of the daily value for folate, which helps to lower levels of homocysteine, a risk factor for heart attack and stroke. 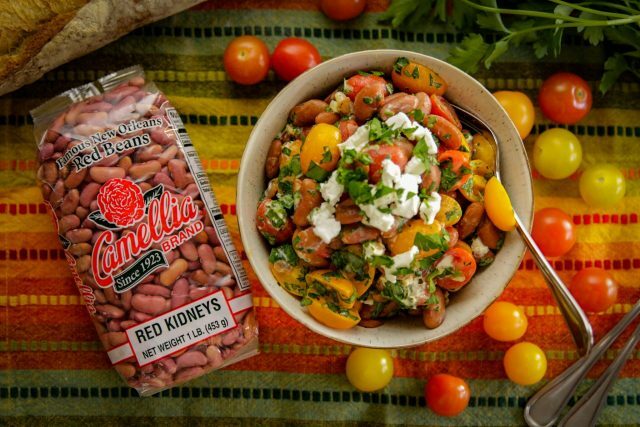 To get more beans into your diet, try these two delicious recipes featuring Camellia Brand Red Kidney Beans. Centered on a rainbow of nutrient-rich ingredients, everything but the red beans is raw, making it a cinch to toss together in no time. Consider this your go-to solution for lunch or dinner in a flash. Making a bowl for just one? Prepare beans ahead of time to make it easy. 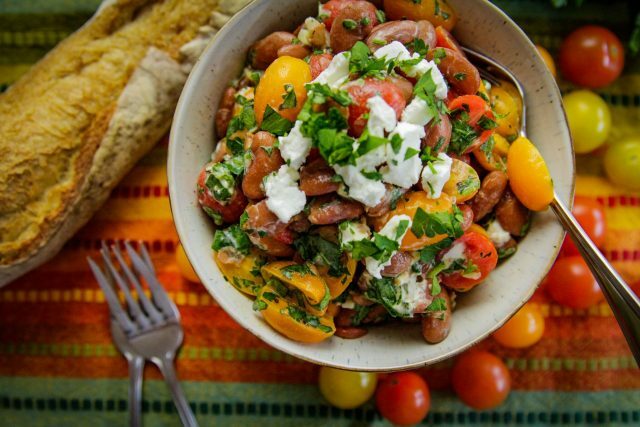 Instead of the feta traditionally used in Mediterranean-style salads, this recipe opts for goat cheese, for about 75 percent less sodium. Colorful, creamy and good for you in every way, this dish is great as a main, a snack, or a side. Molly Kimball, RD, CSSD is a Sports and Lifestyle Dietitian and Board Certified as a Specialist in Sports Dietetics. She’s a columnist for The Times-Picayune|NOLA.com, covering the latest trends in the nutrition and fitness industries and developed Eat Fit NOLA, a free partnership between Ochsner Health System and more than 50 New Orleans restaurants to develop and identify healthy menu items.